F&I Manager G.P. 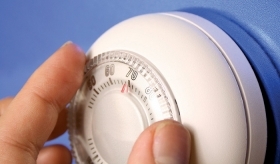 Anderson sets his office thermostat cooler for men and warmer for women so they feel comfortable. But if a couple visits, he caters to the woman. Understanding gender differences, he says, can boost F&I sales. If a married couple is listening to a product presentation in the finance and insurance office and the woman, feeling chilly, asks her husband to retrieve her sweater from the car, the disruption can cost the dealership a sale. So says G.P. Anderson, finance manager of Thielen Motors in Park Rapids, Minn. Anderson tailors his sales presentations to the two genders. He finds that recognizing gender differences and exploiting them can boost the sale of F&I products. He primarily uses color and room temperature to make men and women feel comfortable during his presentation. If a married couple visits his office, he caters more to the wife. "The woman controls the purse strings," he explains. "Ninety percent of women are the decision-makers." Anderson averages nearly three product sales per transaction. His extended service plan penetration is 46 percent on the General Motors Protection Plan alone. "He's good at what he does," says dealer principal Ted Thielen. Anderson makes a couple of assumptions: Women generally tend to get cold easily, whereas men tend to be too warm. He adjusts the thermostat in his office to 65 degrees if meeting with a male customer and 75 degrees if meeting with a female customer or a married couple. During the winter he keeps a space heater in his office under his desk. He makes sure female customers take the chair across from him to his right so that he can aim the heater at their feet. Many will ask if he has a heater and tell him they like it. The next way he fine-tunes his presentation to gender is using paper menus listing the products available for sale. He prints the menu on soft, pastel colors for women and bold, bright colors for men. He changes the colors for the feminine menu more frequently, typically when seasons change. Women are more sensitive to fashion, he explains. His strong penetration on extended service plans is partly the result of his focus on selling security to women. Safety and security is the biggest concern when women purchase vehicles, he says. And if their car breaks down, they don't want to be taken advantage of on the repair. Anderson also applies a little humor on the job. As people enter his office he welcomes them to the "house of happiness." Breaking the ice that way draws a chuckle from both men and women. Humor has universal appeal.